This market is popularly known as 'UmbrellaPullDown Market'. It gained this name because other than the sales of fresh foods, spices, seafood and other edible products, the market people have to often pick up baskets of their goods and move them off the tracks whenever the train is passing. The market has gained reputation as the world's dangerous market as train tracks cut through the market and often results in trains passing about eight times per day, with four times from the Maeklong railway station and four times back to the station. 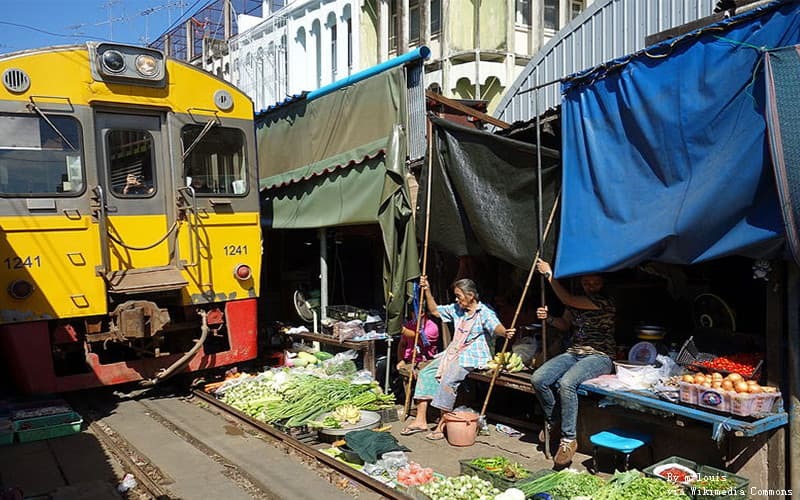 The Maeklong Railway Market is located in the province of Samut Songkhram, found on the Gulf of Thailand. The market was initially set up by fishermen to help them sell their catches. In an effort of better delivery of goods to provinces around Thailand, the railway was built by Thailand officials. The presence of the railway did not stop the activities of the market as traders continued to sell their products in this area on both sides of the tracks. The traders can often be found scurrying about to carry their baskets and move off the tracks whenever a train is scheduled to pass. Although the train moves slowly through the market, few people have lost their lives in the process. If you find crowds here, it is mostly because tourists enjoy watching the train pass and often try to take pictures of the scene. A visit to the market will show traders pulling their wares off the tracks as soon as they hear the horn of a train about to pass. This is where the name 'umbrella pull down' was coined from. They remove their basket of goods, pull down their umbrellas and move away from the tracks. You can also find foreigners trying to take pictures of the train moving and the activity that follows. Some goods are often crushed by the train as the train is mostly so close to the market before traders run off the track, that there is just little space in between. 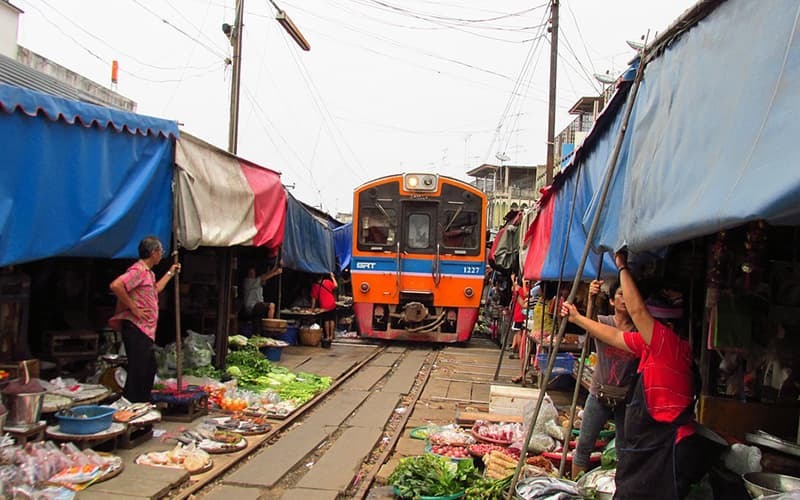 The Maeklong Railway Market is about 80 kilometers outside the city. Getting there by train is the most convenient way of getting there. You can catch the BTS sky train which stops at station Victory Monument. From here, you can catch a minibus directly to the Samut Songkhram region where the market is located. You can get there in about an hour depending on how free traffic is. These minibuses are not only convenient but also fill up rapidly. So, the buses leave as soon as it is full. Although the time of departure of the train is scheduled, they can however, be late sometimes, or the departure time might change. It is therefore important to note the time of departure so you don't miss your train. You can also get to and around the market by booking a SIC tour. 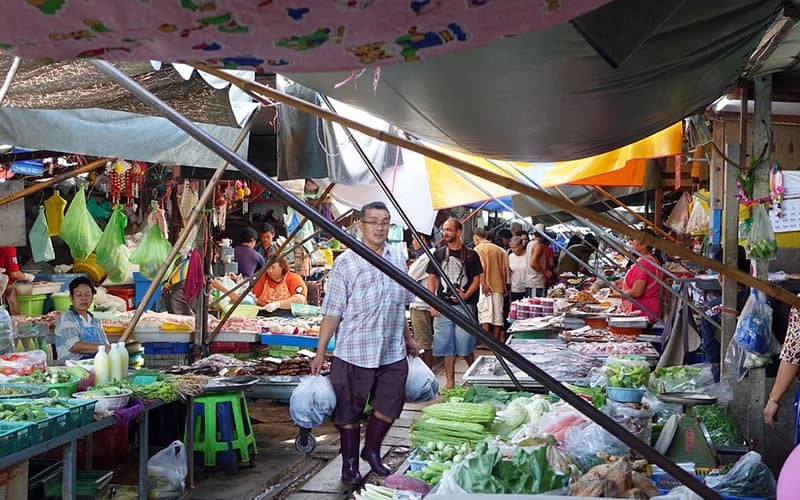 You can only pay from $62 to get a group tour round the market, including a visit to Amphawa Floating Market which is only a 10 minute ride away from Maeklong Railway Market. If you want to have more ideas about Thailand tour packages, inquiry our local travel consultants for a unique customized itinerary. Will get back to you within 24 working hours. This can often give the market a cool and sometimes dark look. Be sure to set your camera to low light so as to get good and clear pictures of the market. It is advised to get there early and move farther down the road as there are fewer people to be found here. The main entrance of the market is always crowded so move further down to get the best of the market. 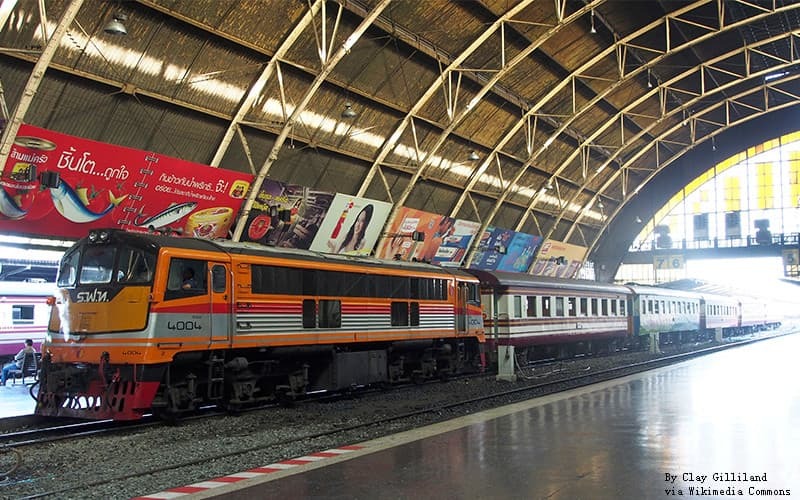 The train goes through the market 8 times in a day; 4 times from Ban Laem Station located in Bangkok to the Maeklong Station and then 4 times from the Maeklong station back to Ban Laem station. This means you can get to watch traders close their ownings and move their wares off the tracks 8 times in a day. 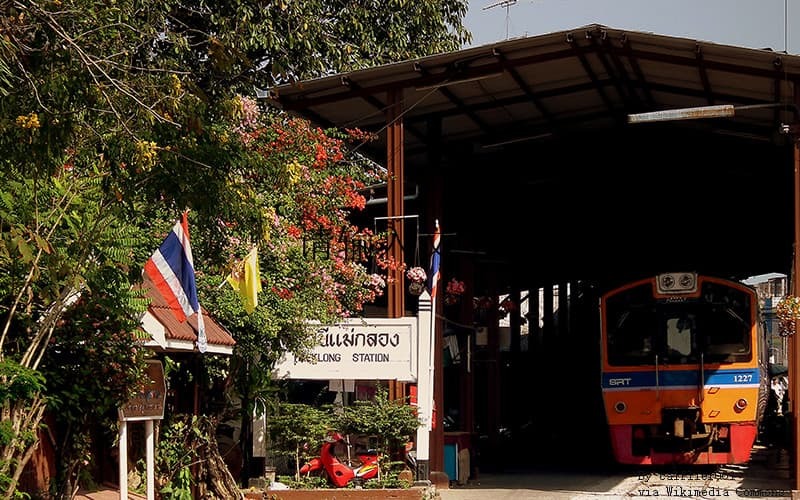 The train moves from Maeklong station to Ban Laem station by; 6:20am, 9:00 am, 11:30 am and 3:30 pm. It moves from Ban Laem station back to Maeklong station by; 8:30 am, 11:10 am, 2:30 pm and 5:40 pm. You should get there early before the scheduled time so you can get a feel of the market before the rush begins. This makes the market really hot as well as the large number of people. It is advised to go there with a fan and some water to cool off. Do not get too close to the train. Create as much space as you can while taking your pictures to prevent accidents and being hit by the train. The train moves slowly but it can still pose danger, so be sure to take proper precautions. 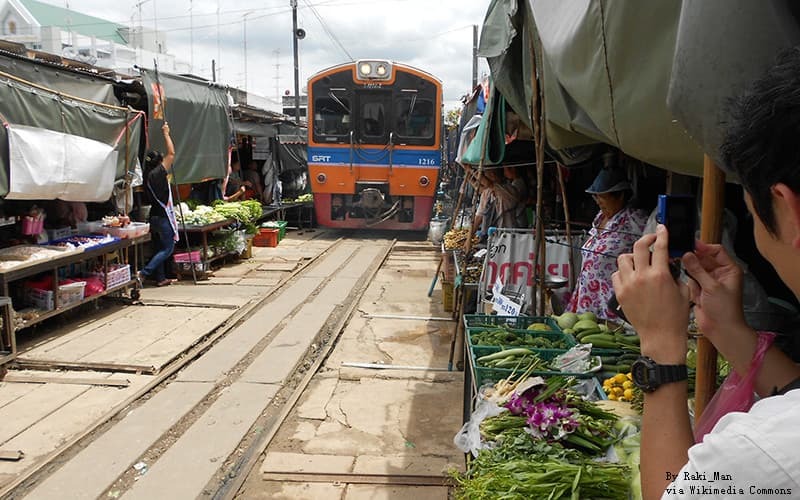 Maeklong Railway Market is more of a tourist attraction. Majority of those found in this market are there for the purpose of seeing the train go by and to take pictures of the train and traders rushing to get their wares off the train tracks. The train moves very slowly and seeing the rush of traders while pulling down their umbrella and getting off the tracks makes for a good tourist attraction. You can also get fresh foods, Thai sweets, herbs, spices, fish, seafood and drinks in the market. It is also regarded as one of the biggest seafood markets in Thailand.